Two male snow leopard cubs leave the den they share with their mother Thursday at the Cape May County Park and Zoo in Cape May Court House.The snow leopard cubs were born at the zoo May 10. The zoo is holding a naming contest for the cubs. Children 12 and younger have until Aug. 15 to suggest names. One of the cubs stands at the den entrance with Himani, his mother, on Thursday. The cubs will remain at the Cape May County Park and Zoo in Cape May Court House only recently began exploring much outside their den. Himani and her cubs sit in the doorway of their den. 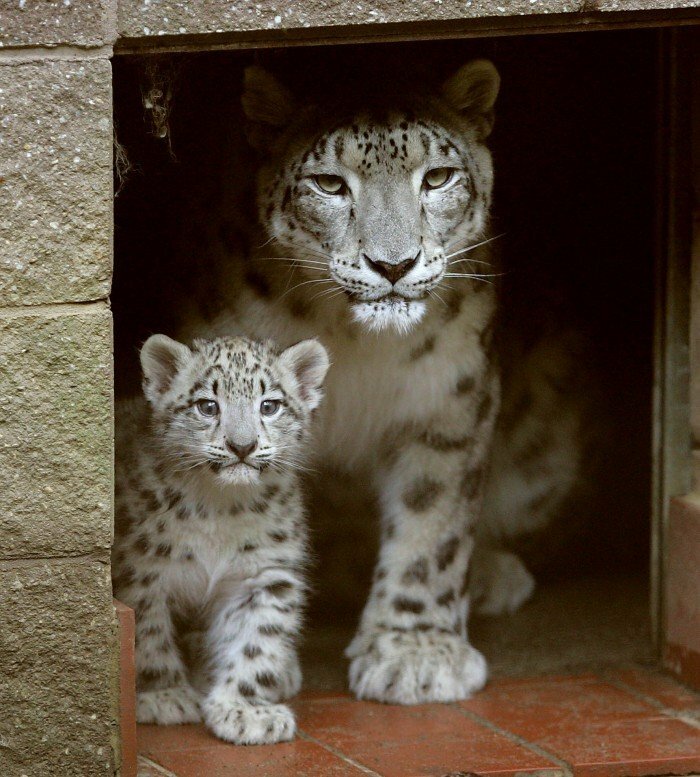 The zoo's snow leopard Vijay fathered the cubs. Visitors to the zoo try to catch a glimpse of the cubs in their pen. The zoo also received two yearling bison a couple of weeks ago from Six Flags Great Adventure in Jackson. A baby lemur, also born at the zoo, clings to the back of its mother Lily as she roams her enclosure at the zoo. A baby lemur clings its mother at the Cape May County Park and Zoo. CAPE MAY COURT HOUSE — Two baby snow leopards born in May at the Cape May County Zoo have begun appearing regularly in public, zoo officials said Thursday. The 2-month-old male cubs had been mostly in seclusion at the zoo with their mother, Himani, until this past week. Now, the small, endangered cubs are growing less skittish. The snow leopard cubs, which have not yet been named, were born May 11. 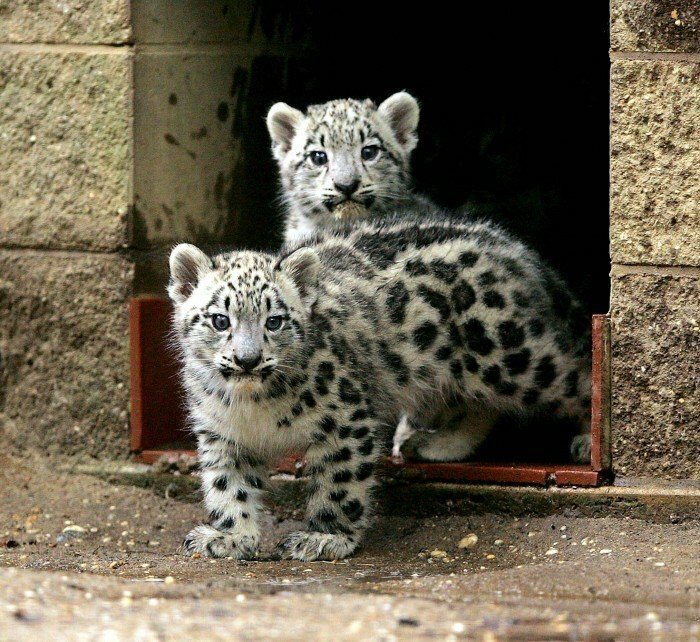 They are the first snow leopards born at the zoo. There were only a few surviving litters of snow leopards born in North American zoos this year, according to the Association of Zoos and Aquariums, which oversees a Species Survival Plan for snow leopards. Eleven cubs were born in captivity last year. The adult male snow leopard, Vijay, has been at the Cape May County Zoo for five years. The zoo recently brought Himani there in hopes that she and Vijay would breed for the species plan, which matches animals based on genetic diversity. The cubs are Himani’s first litter. Ernst said the spotted cubs, which have been nursing, are starting to eat solid food — meat — with their mother. “They’re coming out in public, so we hope people come to see them,” he said. The snow leopards promise to be a main attraction at the zoo for several years. The zoo is holding a contest in which children can pick the names for the two cubs. The contest runs to Aug. 15 and is open to children ages 12 and younger. Meanwhile, the Cape May County Zoological Society, a nonprofit group that works with the zoo, is planning a campaign to raise money to rebuild the snow leopard habitat, which was partially damaged in February snowstorms. The Cape May County Zoo is open from 10 a.m. to 4:45 p.m. daily in the summer. Admission is free.